is on sale for $4.99 at Amazon.com right now. A great price on a fun Halloween DVD for the kids! From director Brad Silberling and Steven Spielberg's Amblin Entertainment comes a live-action fun house ride filled with laughter, excitement and ghostly surprises. “Ghost therapist” Dr. James Harvey (Bill Pullman) and his daughter Kat (Christina Ricci) arrive at drafty, old Whipstaff Manor. Its greedy owner, Carrigan Crittendon (Cathy Moriarty), has hired Dr. Harvey to exorcise the house's apparitions: a friendly but lonely young ghost named Casper, who's just looking for a friend, and his outrageous uncles Stretch, Stinkie and Fatso (The Ghostly Trio). If the plan works, she and Dibs (Eric Idle), her partner-in-slime, can get their hands on the manor's fabled treasure. Meanwhile, Casper has found a kindred spirit in Kat, but The Ghostly Trio will not tolerate “fleshies” in their house. 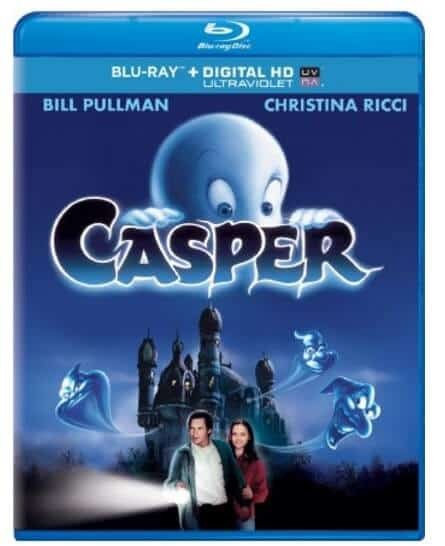 With hilarious antics and dazzling special effects from many of the creators of Who Framed Roger Rabbit and Jurassic Park, Casper is a mile-a-minute adventure comedy for the whole family.